“I have idiots for friends,” was a thought that passed through my mind more than one time yesterday as we plowed through the Tri-State Tough Mudder in New Jersey. The cold water, the mud, the 12-mile course…all took a mental and physical toll as the afternoon proceeded. The thing is, the phrase “idiots for friends” began taking on a different tone as the day progressed. In the morning it traveled through my brain accompanied with a few muttered oaths and the question, “Why did I agree to do this?” But by the time we were a few hours into it, watching the stuff these friends of mine did for each other made that phrase come out literally with a laugh and a sense of appreciation. The way one of them stood at the bottom of the walls and hoisted us up, telling us to step on his shoulders just so we could get over. The way a few of them waited at the top of the half-pipe and pulled not only our entire team to the top, one by one, but a host of strangers as well. The way they formed a human chain, lowered themselves back down a muddy hill on their stomachs, and dragged me to the top. 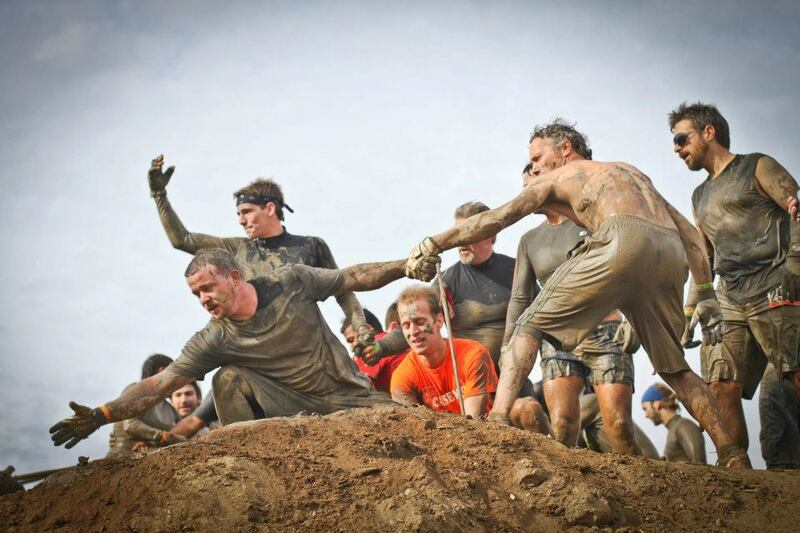 Sometimes, in the Tough Mudder (and in life), you need to have “idiots” for friends. Sometimes you can’t make it through without them. 8:32 – We are on the road. I’m feeling fairly relaxed. We are celebrating the fact that the temperature is supposed to get into the 60s. We do not realize the water temperatures will be in the 30s. 10:14 – We are caught in a traffic jam in New Jersey. The cars move at a snail’s pace. Ben and Patrick hop out and run over behind some rock piles to go to the bathroom. The traffic mysteriously begins to move. They have to sprint a few hundred yards to catch up to our vehicle. 11:20 – We arrive at the Tough Mudder. As we wait to park, police cars race by and you can hear an ambulance off in the distance. Later we would find out that three people broke legs that day and multiple people broke ankles. Just another day at The Tough Mudder. 12:03 – The twelve of us meet up just inside the registration area. Everyone is feeling pretty good, mostly out of ignorance. We all have our numbers written on our foreheads and arms, presumably in case we drown in the lake and they need to contact our families…or maybe Hal Lindsay was correct, the rapture occurred a while back, and this is the mark of the beast. 12:35 – The monster truck revs off ahead of us, and we follow it through exhaust and a host of orange smoke bombs. Let the torture commence. 12:40 – After running the winding track for about five minutes, we reach the first obstacle: cargo nets. We climb up about fifteen feet, across a thirty foot span, and back down. I’m thinking, “This whole thing is not as hard as everyone thought it would be. It might even be enjoyable.” Ignorance is bliss. 12:45 – Obstacle #2 – A dumpster filled with cold water. How bad could it be? Without thinking, looking around, or otherwise pausing, I jump in, but just before hitting the water I notice the thin layer of ice cubes. Hitting that shoulder-deep 34-degree water, going under, and racing for the other side is the most shocking thing I have ever done. I couldn’t get out fast enough. Once I was back on the ground, my entire body was so numb that I couldn’t feel my clothes or my shoes. 12:55 – Our group gathers and heads to obstacle #3: a one-hundred-yard swim across a body of water, at the end of which you have to climb up a 15-foot rope ladder (that isn’t attached to anything at the bottom). Just before entering the water, a surge of relief sweeps through me…I’m so glad this won’t be as cold as the dumpster. Just after entering the water, a surge of panic…This is almost as cold as the dumpster. No way I’m making it all the way across. My clothes and shoes weighed me down. Rumor has it, they dumped truckloads of ice into that lake the days leading up to the event. Whatever the case, it wasn’t more than 50 degrees. Completely numb, again. 1:00 – 4:00 – Wash, rinse, repeat. We carried tires around a racetrack, ran, trudged through hundreds of yards of waist-deep mud, climbed over walls, ran some more, squeezed down through pipes that emerged into water, ran, crawled on our bellies through mud and under barbed-wire…on and on. It started to feel like the movie “Groundhog’s Day”. 4:10 – Mile 11, obstacle #30. A short swim of maybe forty yards, during which you have to go under three sets of barrels. The fact that there were two lifeguards at each set of barrels and about five lifeguards waiting on the other side should have clued us in to something. The water, once again, was ice cold. Each submersion brought on a new kind of headache. I stumbled out the other end and tried to stand up, but the cold water had every single muscle in my body on the edge of cramping. My skin looked sunburned. I looked around and the lifeguards were helping people out of the water. 4:20 – Obstacle #32 – This was it. One last 20-yard sprint through hundreds of dangling wires, each with varying amounts of electricity. They added hay bales so you couldn’t run straight through. Nice. We raced over the bales, two or three of us at a time. You could hear the snapping sounds of wires zapping people. Sometimes you could see sparks. The worst wires had 10,000 volts.This is a family-friendly blog, so I’m not going to mention where I got shocked. Felt like a cigarette burn right on my…never mind. Through the finish line. Thermal blanket. Tough Mudder t-shirt and headband. Free beer. Change sweatshirts. So cold my jaw is twitching uncontrollably. Seriously, a huge thanks to you eleven guys who helped get me through this. And to the numerous family members, wives, and girlfriends who traipsed around that muddy course, cheering us on every chance you got. You folks were awesome. I will run many half-marathons (maybe even a full) I will not willingly run/swim through ice water and mud. Not a chance … so I’m totally impressed! Great job! I actually found this more entitraening than James Joyce. way to go Shawn and thank you for the play-by-play! We wish we could have been there!!!! Can’t wait to hear about it in person! Thanks, Janelle! Looking forward to tomorrow. Sounds both horrifying and amazing! Congratulations on your accomplishment. I’m pretty sure I would spend the next week taking multiple long, hot showers. I can’t wait to not participate in this race every year for the rest of my life! I’m with Bryan on this one. Amazing that you all did it, though — way to go! i am currently sitting in the Oval Cafe on the base TRYING my best to keep my laughter as quiet as possible. i wish i could have seen all of this, i can only imagine. YOU GO SHAWNY! SO PROUD! Congrats Shawn, this sounds like something only a fool would attempt to do. So I would have to agree with you, sometimes you need idiots for friends! Ha! Thanks for reading, Gordie. This piece was a licjeafket that saved me from drowning. Dude. Man cards all around. Super impressed. I love that feeling of comradeship and dare I say, community, that shows up at those events, totally crazy, totally organic and totally rewarding. I know it sounds insane,or idiotic, but I kinda want try being a tough mudder myself. You should do it, Jen. With a team, it’s a great experience. 2. So was it worth it? Did you feel accomplished and satisfied with yourself in doing something so difficult, or were you just cold and tired? 2) It was totally worth it. I felt accomplished, satisfied, cold and tired. 3) You would rock at this. You know how to bring the crazy and push yourself beyond normal limits. 4) Mostly calm, except when running in freak-out circles after the first ice bath. Kuddos Shawn! (Do people still use that term?) Kinda make that 50k I’m training for sound like a nature hike! Did you get the Tough Mudder tat yet? Thank you for that descriptive blog! Loved hearing more about it ’till we hear it in person from Dave! My pleasure! Thanks for coming by. I’m sure Dave will regale you with all the details of our glory as soon as possible. I couldn’t be more proud. You rock. I’m trying to talk a few of my more foolish friends into doing this with me next year. We’ll see. Thanks, David. It’s definitely worth doing. I’m really glad I got a recap of this. I have been thinking about doing it, but I think I’ll stick with the “run for your lives” race when it comes to Dallas. Then, maybe, we will look at the tough mudder. Thanks for the play-by-play!